During my 10-day stay in Paris back in October 2004, I took a couple of baking class for homecooks at Ecole Lenôtre. I was very excited about going to these pastry classes offered by the famous Lenotre at their Pavillon Elysee branch. With my very limited French vocabulary, I managed to register for both the pain d’epice and the opera cake class by email correspondence with the helpful staff. The classes are hands-on and are taught in French with a maximum of 8 students per class. Before I left for the trip, I was a little worry that I would not understand the instructions given in class. Our instructor chef Francois Schmitt was very patient with my limited understanding of the language. The course was represented in a very clear manner that was easy to understand. Not only did I survived the course, I found the classes to be extremely beneficial. The pain d’epice class included five different recipes: ice-cream, crème brulee, pain d’epice, spiced hot chocolate, and a pistachio petit-fours that was scheduled in at the last minute. We began with making the ice-cream since it requires the longest chilling time. The ice-cream was an egg-less mixture containing pureed pain d’epice and candied orange peel. The mixture was fragrant with the four spices. I was surprised to find how rich the mixture was even without the eggs. Next, we began to scale for the pain d’epice. It was a simple cake that didn’t require much skill to make but I did learn the importance of using a flavourful honey such as pine (sapin) or chestnut (chaitagne) honey. 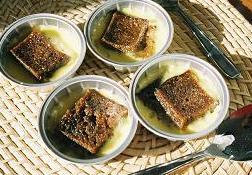 The creme brulee was an easy mixture of uncook custard with a slice of pain d'epice in each dish. The custard was baked in a bain maire until it was set but still jiggly in the center. Don't let the simplicity foold you, this recipe yielded very amazing result. 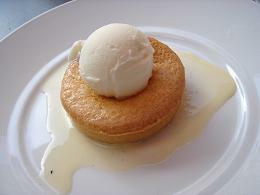 The pain d'epice was soaked with silky custard which made it very delicious. The spiced hot chocolate was a classic european chocolat chaud recipe made with dark chocolate, milk, cream, and sugar but infused with pain d'epice spices. I have yet to come across a cup of chocolat chaud that I didn't like in Paris so I was more than happy to have a recipe from Lenotre. 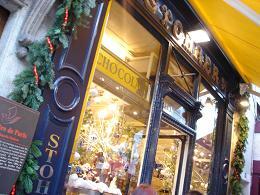 The spices made the rich warm chocolate a bit exotic and it cut the richness well. We enjoyed both the ice-cream and the chocolat chaud at the end of the class while chatting with chef. Since we had all those egg whites left over from making the ice-cream, chef decided to add another recipe to the class at last minute. We used the eggs whites and pistachio paste to make a pistachier, similar in texture to a financier. We baked the petit-fours in a star-shape flexipan which gave them a rather whimsical appearance. How to make a pliable jaconde: do not overbake. It should only take a little colour. Before the batter goes into the oven, remember to run your thumb against all sides of the pan. This prevents overbaking along the edges. How to peel the parchment paper from a sheet of jaconde: turn the jaconde upside-down so that the parchment paper faces the ceiling. Put a cooling rack on top of the jaconde and start peeling. As you pull, the cooling rack is slowly moved away by the parchment as well. The weight of the cooling rack is helpful in keeping the jaconde down and prevents tearing. How to slide a cake layer from the cooling rack to the mould/cake ring. How to prevent the assembled cake from sticking to the bottom of the mould: paint the bottom of the cake layer with melted chocolate and dust the bottom of the mould with cocoa for good measure. In addition, it was also good to observe the techniques that chef Francois Schmitt used such as glazing, brushing syrup onto the jaconde using cross strokes, cutting & trimming of the cake, whipping egg whites, and most interesting of all, making a crème anglaise-based buttercream. I was surprised to find how easy it was to make this rich buttercream without the hazzle of cooking a sugar syrup. 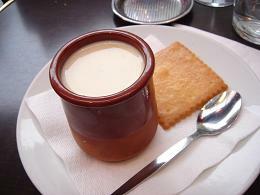 A crème anglaise was made on the stovetop and whipped until cooled to room temperature. By the time it was cooled, the crème anglaise increased in volume by quite a lot. Simply beat in softened butter and the buttercream would be ready for flavouring. Chef also showed us a trick to soften butter using the microwave. Just simply wrap cold butter in clingfilm, heat in microwave briefly, punch & flatten with hand, and heat more as required. This is a very convenient trick indeed that I've been using to this day. Chef cut the sheet cake into smaller portions so that each student had their own cake to decorate. We each got to pipe on the signature script "Opera" onto the cake along with decorative borders using warm chocolate compound in a parchment cone. As a finishing touch, we dotted some obligatory gold leaf onto the cake as well. I got to take this cake home with me and I must say, having opera cake for breakfast with my best friend S in an apartment by the Eiffel Tower was quite a memorable experience! One thing that I absolutely enjoyed in Paris was lingerie shopping. During my last trip in 2004, I saw a set of red and black plaid by La Perla. It was exactly the kind of things I love but for whatever reason, I didn't buy it and I've been regretting since. During my first day of shopping in this trip, I spotted this really pretty set by Chantal Thomass at Le Bon Marche but I didn't have a chance to try them on with only a few minutes until store closing. The design was unlike anything I've seen before...it was so feminine and so pretty in a non-fussy kind of way even through it was adorned with bows. During my very last night in Paris, I went into the Orcanta boutique and finally gave it a try. It was gorgeous as expected. I bought it without hesitation along with another pretty set in pink & brown (my latest favourite colour combination) by Passionata's Managua collection. Compared to shopping for lingerie back home, it was such a joy to shop there. Everything is so pretty and of course, the service was personal and impeccable. One thing that's worth mentioning is Orcanta's loyalty program. It is free to enroll and you get a 5 euro coupon upon first purchase. For every 2 euro you spend at the store, you recieve 1 point. Once you've accumulated 100 points, you get a 10 euro coupon. This boutique carries many great brands and It's definitely a better deal than shopping at the individual brand's boutique. I now have 15 euro's worth of coupon....if only I'm going to be back in Paris in the next 3 months! No visit to Paris would be complete without a visit to Pierre Herme Patisserie. I had a chance to sample a few pieces from his Desirs collection. 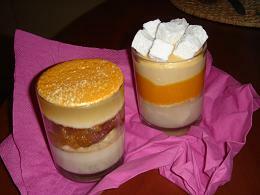 The Emotion is a layered dessert sold in a glass that I'm particularly fond of. On the left is the Emotion Orientale containing layers of pain d'epices creme brulee, soft fruit and dates cooked in tea, and lemon gelee. The tea lends a very pleasant flavour to the dried fruit and it went well with the fragrant spices of the creme brulee. On the right is the Emotion Mahogany with layers of litchi compote, mango compote, coconut dacquoise, and caramel mascarpone cream. I really really enjoyed this dessert. Although I work with tropical fruit very often, I did not discover how well litchi and mango work together until I tasted this dessert. The caramel also tied the flavour together very nicely. This dessert is very inspiring indeed...I'm already getting all sorts of ideas of using this flavour combination. The third item I tried from the Desirs collection is Instant, the teardrop shaped chocolate dessert shown on the right. Inside it's shell of dark chocolate, I found Earl-Grey tea gelee, tea-flavoured ganache, chocolate mousse, and soft chocolate biscuit. I did not enjoy this very much, possibly because I had it too cold. The tempered chocolate shell was very hard and so was the mousse. The flavour was rather muted and the texture was just all wrong to me. From the signature collection, I tried the Desire. It was a sable breton base, lemon cream, strawberry & banana compote, soft lemon biscuit, and fresh wild strawberries. It was a very refreshing taste of lilting lemon and fruity strawberry. I wish I had this at the height of the strawberry season. 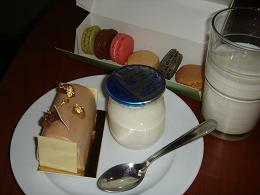 The remaining item in the picture was a bombe de marroon from Rollet Pradier. 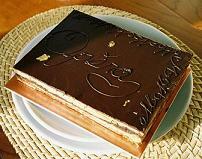 It was a fondant covered cake with chestnut mousse and genoise filling. It was a little anti-climatic after the much more complicate Pierre Herme desserts. So this wraps up my brief stay in Paris this year. I'm looking forward to coming home. 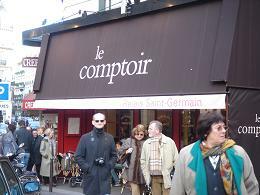 As promised, I returned to Le Comptoir again for lunch today for more great bistro food. My appetizer was a ballotin of rabbit, garnihsed with a wedge of lettuce and a drop of reduced balsamic vinegar. It was very meaty and tasty though in a very straightforward kind of way. The reduced balsamic vinegar was a nice touch though. It was another nice day today so I absolutely enjoyed sitting at the outdoor terrace while watching the world went by. Besides, outdoor lighting makes the picture of the food so much more appetizing in a picnic kinda way! For my main course, I chose the lamb with couscous and dried fruits. I was a little put off by the layer of grease floating on top of the couscous but after a taste of that flavourful couscous, all thoughts of healthy eating went out the window. 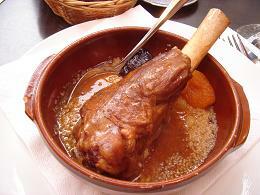 It picked up all the flavour of the lamb without effort. The mixture of dried prunes, apricots, and golden raisins were a nice touch too, adding a little sweetness to this otherwise heavy dish. The meat was very tender after long hours of cooking. My dessert was a pots de creme au chocolate. Now, shouldn't it be brown instead of the cream colour in the picture? That was the question many other diners asked as well. They actually floated a layer of creme anglaise on top of the chocolate pots de creme. Once I dug into the custard, the silky smooth chocolate custard revealed itself. It was again a very simple dessert that was done very well. [Sigh] How I wish I can get bistro food of this quality back in Toronto! Here's a look at what I had for breakfast this morning...starting from the top left corner, there was the Palerme from Gerard Mulot. It was a pistachio bavarois with a chocolate macaron base and filled with raspberry compote in the middle. The whole dome was set on top of a pate sucre coated with chocolate. Next was a lemon tart from Mulot as well. I must say Mulot really knows how to make pate sucre well. Both the lemon tart and their cherry clafoutis have a tender and flaky crust that does not seem at all affected by the moisture of the filling even after long hours. Kudos to them. Also in the picture was a buchette arabica from Laduree. It was an intensely coffee flavour mousse enhanced by the crunchy chocolate/roasted espresso bean garnish. However, presentation-wise, I found the rectangular piece of pate sucre a little silly. 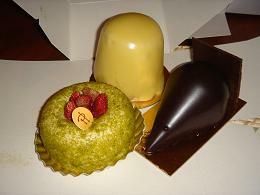 I also had a buchette marron from Laduree but it was not included in the picture. Reason being...I tripped on blvd Saint-Germain while holding the box containing two buchettes. I scraped and bruised my knees quite badly and the buchettes did not survive my fall too well either. I liked the Fauchon version of pear and chestnut buchette better. I have added a Paris: December 2005 photo album to show some of the interesting pictures taken during this trip. These pictures don't necessarily relate to my meals. To me, these that things that captured my attention and made me wish you are here to experience the city with me. Enjoy! It's Christmas time in Paris and to me it means chestnut & buche de noel season. Chestnuts is one of my absolute favourite flavour of all times and the mere fact of seeing the dazzling varieties of chestnut desserts in pasty shops makes my heart skip a beat. Buche de Noel is the ubiquitous Christmas log cakes that signifies the last rush of holidy shopping to me. The traditional buche typically looks like a festive jelly-roll tempered with plastic figurines and too much chocolate frosting. However, most of the modern buche found in pastry shops in Paris are streamlined and so very chic (check out page 18 of the Fauchon Christmas 2005 catalogue). Of course, getting a full-size buche is not at all practical for me during my trip so I was glad to sample the miniature version of individual size called buchette. More likely than not, pastry shops offer more than one flavour of buche de noel and being chestnut season, a marron flavour buche is a given. For example, I had the buchette de poires et marrons from Fauchon for breakfast this morning and it was a very tasty chestnut concoction. The tiny cubes of poached pears in the middle made for a nice contrast of flavour. 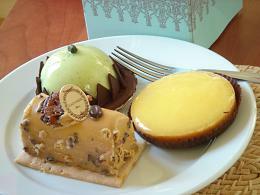 I have two more buchettes from Laduree (chestnut and coffee). I will definitely report back! How Much Does Honesty Cost? Today was my much-anticipated lunch at L'Arpege, chef Alain Passard's famed 3-Michelin-star restaurant. I unwisely packed my morning with a frantic schedule that included multiple stops in some of the busiest stores in Les Halles (E. Dehillerin, G. Detou) plus visit to the Christian Louboutin boutique nearby. Needless to say, by the time I figured out my metro route to Varenne, I had only seconds to spare before my arranged time for reservation at the restaurant. Homard « Arpège » au miel du jardin: one of chef's classic dish of lobster with honey. It was absolutely the best lobster preparation I've ever had. The sweetness of the lobster flesh was enhanced by the flavour of the honey. So refine in an understated way...I will never look at lobster the same way again. Arlequin potager à l’huile d’argan chou, carotte, navet, oignon, betterave, radis d’hiver, céleri-rave…: This was unlike any thing I've ever had before. The huge round plate was totally filled wtih an explosion of colour provided by all the different vegetables in this dish. Each piece of vegetable offered its own unique flavour profile. It was a reminder of all the wonderful gifts nature has given us. It sounds really cliché but this dish was a revelation to me. Grand cru de chocolat noir: a dark and delicious chocolate souffle that so satisfyingly proper. I needed it to erase my last chocolate souffle memory. Of course, there were also an amuse of softly set egg in its shell flavoured with maple syrup and mignardise of pâtes de légume (just like pâtes de fruit except that they were made with vegetables) and puff pastry rounds glazed with whiskey. Compare to my other dining experience at Pierre Gagnaire and Taillevent, I must say there's nothing much in common. 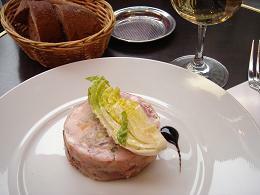 I felt pampered in every way at Taillevent but the food was not particularly memorable. At Pierre Gagnaire, I was blown away by the innovation and showmanship of chef Gagnaire's cuisine. At L'Arpege, neither the service nor the creativity measure up to the previous two but there's a certain sincerity that really shone through. Now that you're forced to read through my thoughts on the meal, I can finally tell you about the 32 euro story. When the bill arrived, I was surprised to find that the chocolate souffle was not included. I struggled long and hard, trying to decide if I should just take the advantage or remind them of the missing item. I decided to be honest. I can only hope that I'm building good karma (and boy I know that this good karma has not come back to me yet...). I suppose I really luck out. I originally didn't expect to do much except for visiting Champs Elysees on Sunday but since it is only weeks before Christmas, many stores have extended their opening hours to include Sunday shopping. My route today look me to the Palais-Royale/Lourve area, down to Les Halles, and eventually to Place de la Madeleine. Walking along rue St Honore towards Les Halles, it was interesting to see the change in neighbourhood--how the boutiques gave way to butchers, bakeries, and epiceries. The more I walked towards the 1st arrondisement, the less glamourous the surrounding appears. 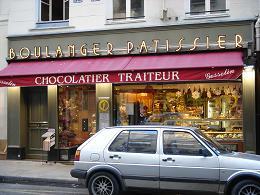 On my way there, I spotted the bakery of Phillip Gosselin. I recalled reading some high praises for his baguette ancienne so I had to try it out myself. The crust was not as crispy as the one I sampled at Poujouran yesterday but it had a very open crumb in creamy colour. The flavour was great. Before I knew it, I was smack in the middle of Les Halles with my favourte kitchen supplies stores steps away. Unfortunately, none of these stores are open so I will have to come back next day to do my purchases. I spent quite a bit of time in Les Halles and Montorgueil in my last trip and really enjoyed the boutique shopping here. As much as I like the department stores, there is something fun and a sense of discovery when shopping in small boutiques. A good number of these boutiques were open today due to the Christmas schedule so I had a great time looking at all the pretty things on offer. 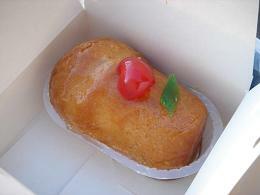 For midday snack, I had a baba au rhum from the very famous pastry shop Stohrer. Legend has it that this is the birthplace of baba au rhum so of course it is not to be missed. I recall not really enjoying it when I tried it two years ago, thinking it was too boozy for my taste. However, I think my taste has changed since. I ate my baba in front of the St Eustache church and enjoyed every single boozy bite. Perhaps eating it at a cold temperature made it better? Dusk comes early at this time of the year in Paris and it was very dark when I walked along rue St Honore back torwards Place de la Madeleine. In the opposition direction, stores became more chic and more exclusive until eventually I found myself surrounded by designer boutiques. There was a costumn jewelry store Satelite that really caught my attention. Absolutely everything in that store was beautiful. If you are like me and have a penchant for romantic intricate jewelry, I think you will like this store too. 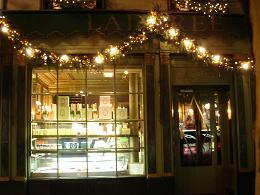 For me, no trip to Paris is complete without checking out the original Laduree shop on Place de la Madeleine. It was crowded as usual and I lined up to get my order of macarons gerbet and marshmallow. After sampling macarons from a number of prestigious pastry shops around Paris, Laduree is still my first love. I bought a selection of chestnut, rose, pistachio, orange flower, black pepper (! ), and dark chocolate. Chestnut is a seasonal flavour but definitely my favourite. Black pepper was just too weird to my liking. I ended my long day with chocolat chaud at the Fauchon salon de the. It was a nice and relaxing way to wrap up a busy shopping day. After hearing so much good words about Yves Camdeborde's new bistro Le Comptoir at the Hotel Relais Saint-Germain, I was determined to dine there this time in Paris. Unable to secure a reservation for one of the weeknight dinners (they have a different menu), I still wanted to try their bistro menu at lunch. After some unexpected delay at the apartment, I finally made it to Odeon around half past noon. The terrace outdoor seating was empty except for two tables but the inside was completely packed. Between the heated lamps above and the blankets that I could use to drape over my lap, I was not at all worry about the cold. It was a sunny afternoon but the chill in the air was unmistakable. Naturally, my menu selection geared towards the comfort food. For my appetizer, I had a hard time making up my mind. There was a rabbit dish that I wanted to try but in the cochonaille section, there were sooo many choices (I have a weakness for sausages, pate, and forced meat). I ended up selecting the basket of sausages with a little ceramic pot of spread. Well, let's just say I was surprised by the portion the minute the plate was set in front of me. 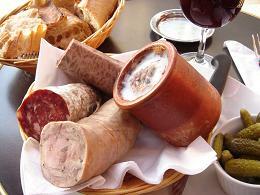 There was a bodin noir (blood sausage), a tripe sausage, and a dried sausage ver similar to salami. The spread was like a rillet. With the crusty baguette slices and a glass of red wine, I could have call this a complete meal. It was delicious. I like the tripe sausage and the spread the best. When the people sitting at the next table saw my order, they ordered the same too. 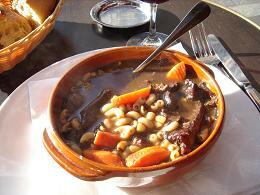 For my main course, I ordered a piping hot joue de boeuf au vin rouge (beef stew in red wine). It was just the thing for this chilly December afternoon. The broth was robust and hearty; the beef was spoon-tender; the carrots were sweet; the wild-mushroom delicious; and the macaroni was the perfect starch to pick up the broth. This is the kind of comfort food that I've been craving since breaking my 5-week meat-free fast. The dessert menu stayed in the bistro style of simple offering. I had a hard time deciding between the apple mango tarte tatin, chocolate pot de creme, and the petit gateau basque avec glace de lait brebis. In the end, I had the gateau basque because it was one of my favourte cakes to make. The cake was moist from the baked-in pastry cream filling and fragrant with almond. The ice-cream has the occassional ice crystal but otherwise was delicious. There are many other things that I would still like to try from their bistro menu. Perhaps I'll visit again on Tuesday. High quality French bistro food is rare, if not non-existent, in Toronto. I enjoy fine dining as much as anyone but you know, comfort food is what I really want now.